The Archdiocese of St. Paul and Minneapolis has reached a $210 million settlement agreement with 450 victims of clergy sexual abuse as part of a bankruptcy reorganization, officials announced Thursday. At $210,290,724, it is estimated to be the second-largest payout by the Catholic church in the U.S., according to the Associated Press. It comes after nearly four years of bankruptcy proceedings and negotiations. “I recognize that the abuse stole so much from you. Your childhood, your safety, your ability to trust and in many cases your faith. Relationships with family and friend relationships in your parishes and communities were harmed. Lives were forever changed. The church let you down. I am very sorry,” Archbishop Bernard Hebda said to survivors at a news conference Thursday. The archbishop said abuse survivors can expect payments to be issued quickly. First, the plan needs approval from a bankruptcy judge before it is sent to victims for a vote. Only then will the money be placed in a trust managed by an independent trustee. Individual awards have not been determined. At a separate news conference held by some of the victims, their lawyer, Jeff Anderson said he expects the archdiocese’s final proposal will be readily approved. Shortly after the announcement, a handful of abuse survivors expressed relief that the litigious part process was finally over. “I have been fighting in court with the church now for 13 years. … This has been a long day coming, ” Jim Keenan said battling tears. “If anybody out there is wondering, ‘Do I have the legs to stand up under my voice?’ You absolutely do. Even when you’re kneeling. Even when you’re stumbling. You got the legs to stand up and hear your voice,” he said. Anderson, who wept as he praised victims for their willingness to step forward. “As a result of these survivor’s courage, there have been 91 clerical offenders in the archdiocese now exposed and listed as credibly accused offenders that had never been listed and exposed before,” Anderson said according to ABC News. As NPR previously reported, the archdiocese filed for Chapter 11 bankruptcy in 2015, two years after Minnesota passed the Child Victims Act. The law opened a three-year window lifting the statute of limitations for victims of child sexual abuse to report new cases. The legislative change ultimately led to hundreds of new victims filing claims against institutions including the Catholic church. One of the most recent delays in the proceedings was a dispute over whether parishes and other nonprofit entities are considered independent or part of the archdiocese, in which case their assets could theoretically be sold off to cover the cost of damages. 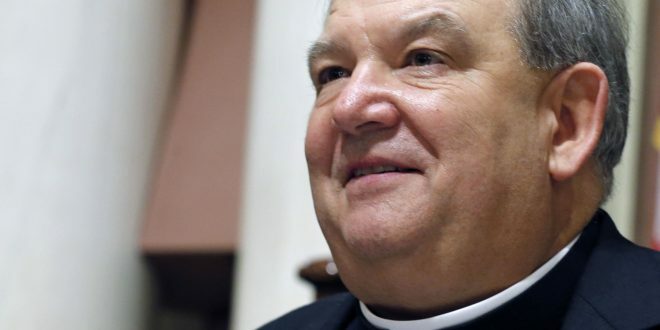 But a federal appeals court judge last month upheld an earlier decision that the property of individual parishes cannot be liquidated for the purposes of paying off the archdiocese’s debts. That moved both sides, which had been ordered by a judge to enter back into mediation, a little closer to an agreement on the size of the settlement. Insurance carriers will pay about $170 million of the settlement while the archdiocese and parishes will pay about $40 million, according to Abood. However, Archbishop Hebda did note a few initiatives the church has already rolled out. All employees and volunteers within the archdiocese working with kids are being trained to how to spot and prevent abuse, Hebda said. The largest clergy abuse related settlement to date was reached in 2007 by the Archdiocese of Los Angeles, which paid 508 victims $660 million. Before concluding his remarks, Hebda said Thursday’s resolution marked the end of a difficult period for many but also signals a new beginning. “The completion of the bankruptcy process allows pursuit of a new day that has many realities – atonement, healing and restoration of trust,” he said.